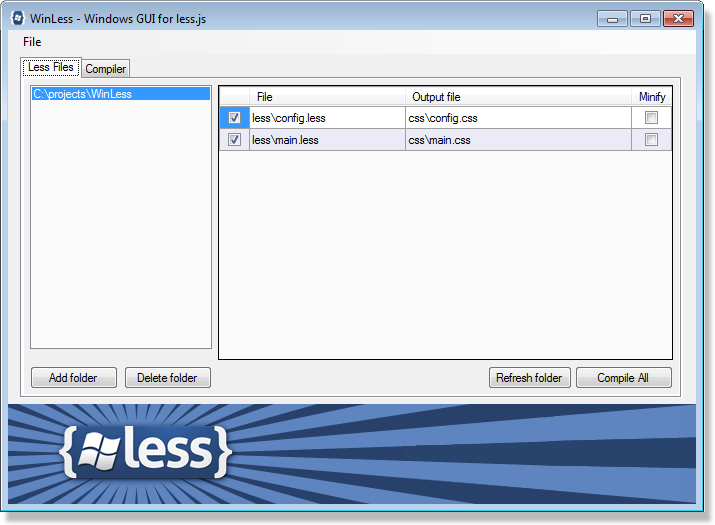 WinLess is a Windows GUI for LESS.js. WinLess is a must-have for the webdeveloper who uses Windows. Do you like WinLess? Consider donating. If you have a folder called 'less' and a folder called 'css' on the same level, add the parent folder. WinLess will then automatically use the css folder as output folder. There are a lot of other great LESS tools out there. Be sure to check them out. NEW! Option to use globally installed less. Automatically compile LESS files on change. Automatically compile LESS files when a LESS file it @import's changes. Shows tray message on compile errors. Option to start with Windows. Can be called with command line arguments. This is also where you can report feature requests / bugfixes and find the changelog.